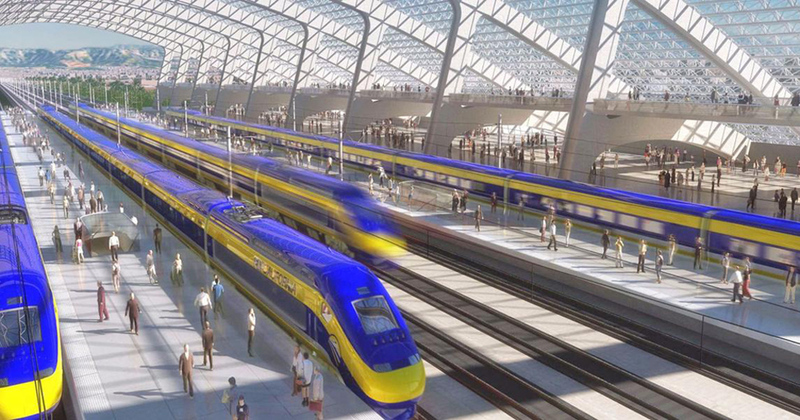 California had planned for a high-speed rail project between Los Angeles and San Francisco. Illustration: California High-Speed Rail Authority. California Gov. Gavin Newsom is scaling back a publicly funded plan for a high-speed rail project that would have allowed travel from Los Angeles to San Francisco in less than three hours. Instead, he said he favors a shorter train line in the Central Valley, potentially pausing the state’s pursuit of what could have been the largest public takeover of private land in its history. During his very first State of the State address Tuesday, Newsom said he is reducing the scope of a plan voters first approved in 2008 for $39 billion but has escalated to a projected cost of $77 billion. The move deals a potentially major change for commercial real estate investors, owners and lenders who were planning to take advantage of changing land values near high-speed rail lines or stations. Instead, he said the state has the capacity to complete high-speed rail in Central California between Merced and Bakersfield. The Central Valley portion of the high-speed rail is designed at more than 100 miles while the larger rail line plan stretched roughly 500 miles across the state. Zev Yaroslavsky, a former Los Angeles City Councilman and a former member of the Los Angeles County Board of Supervisors representing District 3, said the high-speed rail project between Los Angeles and San Francisco was not promising from the start. The project dates back to 2008 when it was first kicked off as a result of a voter initiative while Gov. Jerry Brown was in office. At that time, it was projected to have an estimated cost of $39 billion and be completed by 2020. Construction began on the project in 2015 but the cost had increased to upwards of $77 billion, largely because of the amount of property it would take to build the route. The completion date of the first phase of the project had most recently been scheduled to open in 2033. “I think the governor is facing up to reality by not throwing good money after bad,” Yaroslavsky said. The public looks to be on Newsom’s side in the decision. The project had earned the nickname “bullet train to nowhere” by its critics. Only 19 percent of 1,7000 likely California voters said high-speed rail should be a high priority for receiving new state funding, according to a recent statewide survey by the non-partisan Public Policy Institute of California. Newsom promised to now hold contractors and consultants more accountable when it comes to cost overruns and how taxpayer dollars are spent. He also announced a new chair of the California High-Speed Rail Authority , his economic development director, Lenny Mendonca.